Assessment publishing refers to the way your assessment is made available to respondents. The way your assessment is published is set when you are creating your assessment. When creating your assessment you are asked the question "How will candidates or participants access the assessment?". For more details on creating assessment please see Creating Assessments in the Help. 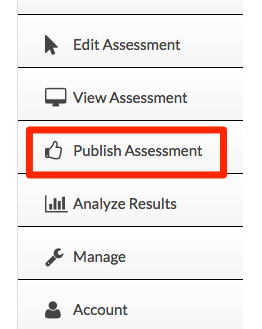 Edit Assessment -> Assessment Settings -> Publish Settings. After results exist for an assessment you cannot change the way the assessment is published. There are 3 ways your assessment can be published. Your respondents come to our site with a general assessment ID. This ID is unique to your assessment and users can enter it on our site after clicking the Take Assessment button or link. You have the option of adding a general password for the assessment (this password is the same for all users). When a password is added the assessment access is restricted. Public assessment are linked by a URL or users can come to this site to take the assessment. If uses come to the site to take the assessment they use a unique assessment ID. You can provide optional password which is the same for all users who access the assessment (restricted assessment). Send an email invite. This email is sent to a list of invited people. In the email a there is a link that is clicked to access the assessment. Each user is sent an email invite to take the assessment with a unique link. You can set how many times a person can retake the assessment using the link. By default assessment can only be taken once, unless you allow multiple retakes. Can be paused and resumed. Users must come to our site to take the assessment with a general assessment ID. You can set how many times a person can retake the assessment using the unique ID or password. By default retakes are not limited, but you can restrict retakes.